10w / 12w / 45w / 60w / 85w compatible. You’ll never run out of power. Applies to Apple AC power adapter. With an auxiliary plug connector, our product is an ideal choice. In the event that your creditor(s) takes possession of your assets. You are subject to an application or order for bankruptcy. This item is an official Apple EU plug for USB. This can be used for iPhone, iPad, iPod, Apple Watch etc. We only dispatch to Mainland UK. European EU AC Wall Plug Power Adapter for Apple iBook/Macbook White 250V UK NEW. EU AC 100V-220V Plug For Apple iphone ipod ipad Power Adapter. Compatible with Apple AC Adapters: iphone,ipod,ipad ect shullf style. Convert most Apple AC plug to EU style. ● 1 x EU AC Plug. This item is for what use. Applies to Apple AC power adapter. With an auxiliary plug connector, our product is an ideal choice. You can follow below process to chontact us. All pictures are for illustration purpose only and Colours may vary slightly. Connect the adapter directly to your iPad, an iPad Dock, or to an iPad keyboard dock. Plug Standard: EU Plug. Simply plug one end into the wall. Output: 5.1V, 2.1A (Max). Light weight and convenient for traveling. Compatible with:Apple Macbook, Macbook Pro, iPad, iPad2, New Pad, iPad 4, iPad Mini. Connector:EU Wall Plug. 1 Wall Plug. Jack of all trades and master of none. 1 EU Wall Plug Included. NOTE: 2A= Port 1 Port 2. Compatible with most USB phones & devices. FREE Trial ! Applies to Apple AC power adapter. You can follow below process to chontact us. With an auxiliary plug connector, our product is an ideal choice. All pictures are for illustration purpose only and Colours may vary slightly. Syncwire - Leads to a Smarter Life. With interchangeable US / UK / EU travel adapters to easily fit into an All-in-One travel plug, compact design, lightweight and cover100v and 240v input are perfect for travelling. Compatible with: Apple Macbook, Macbook Pro, iPad, iPad2, New Pad, iPad 4, iPad Mini. Connector: US / EU / AU / UK plug optional. THX for your kind understanding. Cable Length: about 1.8 m / 5.91 feet. 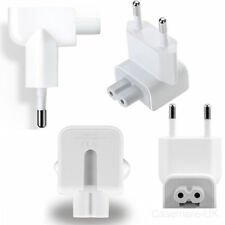 Genuine Apple EU iPad iPhone iPod 10w USB Mains Charger & EU Plug. (WHITE) EU 2 PIN PLUG. DESIGNED FOR USE WITH YOUR APPLE USB CHARGING CABLE. Applies to Apple AC power adapter. With an auxiliary plug connector, our product is an ideal choice. You can follow below process to chontact us. color: white. All pictures are for illustration purpose only and Colours may vary slightly. 60 LED NEW HOT GU10 220V High 3528 SMD Lamp Bulb Power Spot Light 5W White 6500K. Hair Growth Oil Anti Hair Loss Essential Oil Ginger Hair Growth Essential Oil. 1Pcs Wine Rack Cabinet Hanger Hanging Wine Goblet Rack Glass Cup Holder Bar.